Setup Area: 55ft. x 18ft. x 22ft. Slide Down Our Biggest Water Slide! The Tropical Tsunami is an outstanding water slide that is sure to take your guests by storm. At 22ft. tall this water slide with a slip n slide attached is the largest in our inventory. Featuring a huge tsunami wave on top of the slide and palm trees throughout the slip n slide, this massive custom made water slide is sure to please kids and adults alike. Take turns climbing your way up to the top, where the steep angle of the slide will have your adrenaline pumping! Get ready to take the ride of your life, sliding through 70 feet of cool refreshing mist before splashing into the pool. 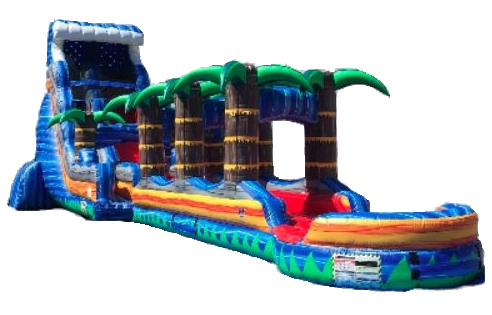 Bright vivid colors makes this inflatable water slide rental the centerpiece of any party. Reserve our biggest and best water slide today for birthday parties, family reunions, church functions or corporate events, to make memories that will last a life time!